What Do You Remember Eleven Years Later? I remember talking to my sister-in-law on the telephone, making plans to meet for lunch as the hosts of Good Morning America made conversation in the background. Life was solid then. Buildings stood upright. Terrorists were actors in movies. Airplanes were safe. Flight attendants gave us pillows and blankets, magazines and meals, and we worried mainly about making our connections on-time. Before we decided on where or when, there was one airplane. And then another. I recognized the dark intentions of someone whose name I did not yet know. Covering my mouth, my eyes glued to the television, my sister-in-law and I talked at — rather than to — each other. We watched the flames and the slow, inevitable collapse as one tower and then the other sank into ashes. I looked at my 25 month old son. Sitting on the kitchen floor, he’d built a tower out of wooden blocks. And, using a toy airplane, he laughed as he knocked it down. I turned off the television, knowing we would soon go to war and that our world would forever be different. Where were you eleven years ago today? What do you remember about life before 9/11? This entry was posted in Memoir and tagged 2001, airplanes, Al Quaeda, new york twin towers, September 11, terrorism, Tower I, Tower II, tribute. Bookmark the permalink. ELEVEN YEARS AGO TODAY, on September 11, 2001, I met a friend for breakfast at a truck stop near Ephrata, Pennsylvania. When we went to pay for our meals, we found a small crowd of people staring at a TV that was hanging on the wall behind the cash register. On the screen was a breaking news bulletin, showing a commercial jet airplane flying into one of the twin towers of the World Trade Center in New York City. An insane, surreal sight. What had happened? An accident? But, how? I paid for my breakfast, said goodbye to my friend, then got into my car, intending to make the thirty minute drive south to my home. The first thing I did was turn on my car’s radio. Within minutes, another news bulletin announced that a second jet airplane had just flown into the second World Trade Center Tower. The next two bulletins came in rapid succession. A jet had flown into the Pentagon. And yet another jet crashed in a field in western Pennsylvania, seconds after cell phone calls from that plane indicated that it had been hijacked by terrorists. I realized then, as I drove through the countryside in eastern Pennsylvania, that we were surrounded. 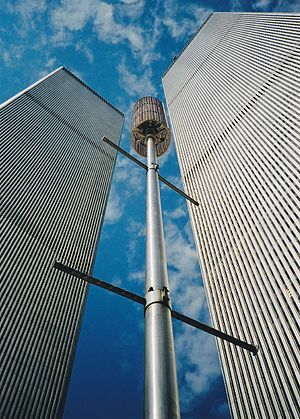 New York City’s World Trade Center was to the northeast of where most of my family and I were then living. Washington D. C.’s Pentagon was to the south. And the site of the fourth airplane crash was in a Pennsylvania field to the west. Our country was under attack, and we were surrounded. Instead of going home to my farmhouse apartment, I drove to the retail clothing store where my 20-year-old son was working. As soon as I walked in the door, I saw my tall lanky son about halfway back in the store. He looked up and our eyes met. His face was the saddest that I had ever seen. My son went to the front of the store and told his manager, “I’m going to take a short break, my mom is here.” Then we walked outside together, my son and I. We sat down side by side on the edge of the sidewalk. He took a pack of cigarettes out of his shirt pocket, and offered me one. I took it. We sat there in silence for several moments, smoking our cigarettes, staring up at the trees that separated the parking lot from the rush of traffic in the street beyond. Today, eleven years later, I see the images that have never left my mind, and my tears fall. Why must people hate and kill? What the hell is the point? Lady Q. Thank you for sharing you post here. I remember staring at that 2 year old thinking: “We’ll probably still be at war by the time he is 18.” We’ll see where we are in 5 years. The world has changed. Remember when you could actually greet people at the gate in the airport? I miss that. A lot. Glad to read your words! I was in the middle of teaching a class at NASA. One student kept checking his phone (which, admittedly, was starting to drive me crazy) then finally he raised his hand and informed the class that something was happening in New York. We tried logging on to CNN.com but the sites were overwhelmed and we couldn’t get any information, so we adjourned to the media room. The room is like a small movie theater, complete with a gigantic stream where we could view the news. We watched as the second plane hit. It didn’t seem real. We were watching it unfold on a movie screen, but it wasn’t a movie. As I stood there, I could hear announcements over the PA announcing what threat level we were on. Being a non-essential employee (a contractor) I was informed that I should get out while I could. Once the threat level reaches a certain point, the whole campus goes into lockdown – no one in, no one out. By the time my car passed the final checkpoint, they’d raised the threat level again and went into lockdown. The drive home was surreal, listening to everything happening on the radio. Getting a call from my sister, who was at my apartment, freaked out to wake up to that news and frantic to get a hold of me. It’s weird to think of life before then. The fear and hate that people still hold on to – the aftermath for any (including me) who’s dark hair and features called into question what kind of person they were. I think that helped seal the deal for us. Racial and ethnic diversity appeal to me. And there was no way that I was going to live in fear of my neighbors. Another reason I love ya. I remember not quite grasping what it meant that the buildings fell. I just wasn’t getting the magnitude over the radio. I needed to see pictures I guess. Really my strongest memory is afterwards. At the time I was living in a neighborhood that saw lots of planes going to the Philly airport. Then we had a no flight order for a period of time. I will always remember the first plane I saw after the order was lifted and just watching it till I could not see it anymore and wondering if it was going to land safely, crash somewhere else or what was going to happen next. It was a wonky time. I was so happy when Facebook was invented by the time Katrina happened, so people could check in with each other faster. You can never shake me, Jeff. I was in the car on my way into class, not feeling very well. I was going to talk to my professor (who became a good friend of mine) and tell her I wasn’t feeling well and wasn’t going to stay for class. I heard on the radio that a plane had hit one of the towers. At first, I didn’t believe it. I was listening to WAAF, a station who once stated that the mayor of Boston was murdered (which got Opie and Anthony fired). I thought this was another crude joke of theirs. Then they started talking about it and I realized it wasn’t a joke at all. I drove home in shock. What kind of plane was it? Who could do this? Why would they? I made it home just in time to see the second plane hit. I found out almost a year later that one of my greatest friends was IN the towers. She was an EMT and saved countless lives that day. Her EMT partner was in the first tower that fell. He didn’t make it. I pray to God every 9/11 thanking him for keeping her safe. Because I saw it happen, I knew it wasn’t a joke. I knew it was very, very intentional. I knew it was not an accident, especially after that second plane. Someone I went to college with died on the plane that was headed for the Pentagon. Someone I knew well died when Tower II crumbled. My cousin, who was very pregnant at the time, had to walk miles to get out of the City to catch a cab or something so she could get home in New Jersey. My other cousin had decided to stay home that day. She wasn’t feeling well or something. She worked right across the street. Crazy stuff. Thanks for sharing your memories, Eric. Thanks for your post, Renee. Back then, I taught classes at George Washington University. Since I live in Virginia, I drove past the Pentagon every time I needed to get to school. RIGHT past it – on the western side that was struck. I was teaching on a Mon/Wed schedule, for the first time in ages – usually I was on a Tues/Thurs schedule. This was a Tuesday, and I was home. At 9:37, when I would have been going right past the Pentagon. For a long time afterward, we couldn’t drive that way, but had to detour around. That was ok; I didn’t think I could bear to see it. When they opened up the road again, I remember a totally blackened oak tree, still upright by the corner of the building. The site just chilled me. When the flight restrictions were lifted (and I’m with Jeff, it was really creepy not having any planes in the air, and then creepy when they resumed), it was so unnerving to drive across the Memorial Bridge, which was my usual route. The planes fly so low over the bridge on the way to National Airport. And it’s centrally located amidst all the gov’t buildings. I remember driving across the bridge, looking up to make sure that every plane flying over had its wheels down, getting ready to land at the airport. (Which was a challenge, since I’m driving on a narrow-laned bridge, for crying out loud). That blackened oak tree is a powerful image. Is it still there? I can’t imagine being so close to things. You must have been petrified. These days, I always look up when I see airplanes while I’m in New York. It was different, up here in Canada. I was a server then and had just taken a breakfast order for some Hydro execs. Through the scraping of plates and low hum of conversation, I heard the music stop on the radio station being piped into the restaurant. One by one, diners and servers alike stopped to listen. Within a minute, there was silence all around, as I stood in the middle of the dining room, coffee pot in one hand, dirty plates in the other. I didn’t understand what I was hearing, blinked a few times before my gaze fell on a regular customer. Our gazes held for a second – a minute? An hour? – before he raised his cup, took a sip and set it down. “It’s like the end of world or something,” he said gravely and looked away. I blinked again as the Hydro execs rose, four-as-one and shoved back their chairs. One glanced at me, tossed some bills on the table, nodded and they rushed out. They didn’t run, but the hard looks on their faces and that I could see that they wanted to…well, it chilled me. And still, we listened to the radio announcer, his voice higher and shakier than I’d ever heard before, describing what was coming through the station’s newsfeed. One plane, crashed into the Twin Towers….chaos, fire, explosion…another plane.. OH GOD, ANOTHER PLANE!….. It was surreal. It was unbelievable. It was the first time I’d ever realized that we – as a society, as a people – were vulnerable in ways I’d never imagined. I did not know, in those first terrible moments, that this was an act of terrorism, could not have even formed the thought if I’d tried. But the sense of vulnerability stuck. Stuck with me all through that awful day, as I raced home, listening to the end of my world as I knew it, on the car radio. Called my then-boyfriend, now husband. Called my boyfriend’s dad/ now FIL, who worked in downtown Toronto and whose safety I now worried for. Called my parents, left a series of frantic messages, spoke of shock, spoke of fear, spoke of love. And then I sat, watching the images of the horror unfolding in New York – and at the Pentagon – on an endless loop. This was how my FIL found me as he came through the door at the end of the day. Without a word, I flung myself on him, this man whose idea of intimate contact is a handshake and who only tolerates my daughterly kisses on his cheek. I wrapped myself around him and hung on. It was later, much later, as I lay in bed in the dark, that I realized that he had hugged me back. That in offering me comfort, he too was comforted. Whenever I think of that day, it’s this moment I remember first. The horror of it all is secondary to that hug. I am so grateful for that. Wow, Liz. If that isn’t your blog today it should be. I have often wondered what 9/11 meant for Canadians. Did it feel creepy in the same way. I’m so glad you had a father-in-law to throw yourself into, to curl around, to be comforted by, and comfort. I wonder if he remembers that moment. I’ll bet he does. Well, my love, I have you to thank for today’s blog post…I’ll just go ahead and post this, shall I? I’m glad he was here, too. Is here. Initially, I think Canadians felt a teensy bit removed from everything, even as the shock and horror of 9/11 flowed through us, in real time. Within hours, though, I’d say that changed and thousands of my fellow countrymen and women flocked southward, to lend a hand, lend money, lend a shoulder – to be, as it were, a soft place to land. Further east of here, in the Maritimes, several hundreds more opened their homes, their pantries and their lives to Americans (and others) who found themselves in grounded planes in another country. Nothing – aside from hugging my FIL – has touched me the same way since. It sums us up nicely, I think. I do hope you reposted this at your place. It is so very you. Gorgeous. Better than the post that inspired it. So scary. The first time we were ever really attacked by terrorists on our own soil. And now they live among us. They do. Sometimes I wish we could go back to the ignorance of before. This is characteristically beautiful and moving. On September 11, 2011, my personal world was beginning to crumble just like those towers, only I wouldn’t get the first inkling of trouble for another year and a half. Oh Hippie, that is enigmatic and awful. I’ve read other people say similar things. That September 11 began an unraveling for them. You seem to have turned out no worse for the wear. Zee adoration, she is mutual! I was very young back then. I remember being 10 years old and in 3rd grade, and I had arrived at school where things were… Silent. What scared me most was that I didn’t know what had happened. I didn’t understand why. Why didn’t anyone say hello back? Why did no one talk? Why did we have to sit and watch TV instead of start class? Why did those buildings I saw happily from the monorail months before burn so much on TV? Yet, the silence. The silence is what scared me, it was almost deafening. All we could do was sit and watch everything burn. Thinking back to it makes me feel a sense of dread – almost like being in a tight, dark space. It would take a few hours before someone finally told me what really happened. My parents mostly clarified it for me. We were attacked, and the world was in a panic. Thousands dead, hundreds more injured. Even more MIA. It reminded me of the stories of Pearl Harbor I used to hear from the older crowd – except it was a lot closer this time – a lot closer. I had no idea how bad everything was. I was 10, I couldn’t comprehend the severity of those events. I still don’t understand completely. I don’t feel what other people feel, I wasn’t there, and I won’t ever know – or so I pray. Yet, what angered me more about all of this, was how much more hate we shot out into the world as a result of all of this. As a kid, I thought: We were attacked because of hate. Next, we started hating a whole group back. Why? We were just the same as them, in my opinion. I was told to look at Muslims differently. People who were called “Towel Heads” were our enemies. I ignored it. I didn’t care. It was all hate, it was all the same. How can you hate everyone if only a few caused the problem? Hi Connor! I hope you are well. I’m so happy to see you are still out there, following along. Those were dark days, for sure. I always wonder if we HAD to create a war. Like you said, obviously, Al Quaeda — like all terrorist groups represent people on the fringe of a belief system. They are fanatics. But they cannot be ignored. Sometimes I wish we could go back to the days where we had sweet ignorance: to that time when we believed everyone loved our country and wanted to live here because our country represented all that is good and right. And then I realize that is exactly what the other side believes. I was living in a residence full of international students. I woke up a bit early and had a lovely morning lounging around getting ready- i was standing at my door to lock it and head out for my morning class and one of the girls on my hall said you need to come see this on the tv. My heart sank- she didn’t say anything else- but she rarely spoke so i knew it was important. I joined pretty much the rest of the kids on my floor and watched as the second tower was hit. We spent the rest of the day and the night wondering what that meant for us – individually and collectively. I called my mother and she said i wasn’t allowed to come home (they lived in one of the hot spots for terror list that was put out later that day) and wasn’t allowed to go to the mall. Most of the people around me were so far from home and one girl’s mother was in New York and unreachable. We all feared the worst. We watched the tv replays until we had it memorized. When i think of that day i remember the hallways full at 3am – no one dared to sleep – the international students wondering if they’d ever get home and us wondering what would happen next and how the united states would manage with an attack on home soil. Oooh! When the quiet girl is talking, something is up. It was such a scary day. Those replays, over and over… it seemed like the events kept happening all day. It was kind of like the moment the media realized its awesome power. You capture that moment perfectly. I think one of the things I found most chilling about that day was how the hospitals went into overdrive, waiting for the victims to appear — and they never did. For the most part, people walked away, or they were dead, and there was nothing in between. Then there was the video that came from a youth who slipped in and filmed. The gray and the rubble was beyond what any movie producer could have dreamed up. And the oft repeated refrain from those around me. “It’s just like a movie.” Because here in America we were safe. Those things happened in the Middle East. They didn’t happen here except in the movies. The Onion was brilliant that week. “God Reiterates the ‘Don’t Kill’ Rule,” “Terrorists Surprised to Find Selves in Hell,” “America Wakes Up in Bad Jerry Bruckheimer Movie,” and “Kansas Housewife, Not Knowing What to Do, Makes Cake and Decorates it Like a American Flag.” Those may not be the exact words, but you get the idea. They perfectly captured the feel an our reactions without minimizing the situation. And it was so quiet. Not a sound in the sky for days except the occasional military flights overhead. And people were quiet, too. Polite, soft-spoken, and going out of the way to help each other. For the first time in a very long time, we were all Americans, and we were facing trouble together. And my son was five. He had just started kindergarten. He saw the images and deeply internalized the fact that there are evil people in this world. It was a formative moment for him on a very personal level, and it has shaped his choices from that day. What many people don’t realize is that we had Bin Laden once before after the USS Cole was bombed. (This has been public for a long time, but it got no air time in the media.) Our intelligence services pinpointed Bin Laden, and National Security Advisor Sandy Berger sent an attache to Clinton to get the order to take him out. Clinton wouldn’t stop his golf game to talk to the man. A second officer went to the golf course, and Clinton wouldn’t stop golfing to talk to him, either. By the time the game was over, Bin Laden had moved, and the chance was lost. How many lives could have been saved if Clinton had cared enough to listen to his intelligence community when they indicated they had urgent news? No wonder there are so many gushers over the fact that Obama quit golfing long enough to give the order. Apparently, that is above and beyond the call of duty. Thank you for sharing your experience, Renee. With all due respect, Piper, it is my understanding that Bill Clinton tried to get Bin Laden with special forces and ALMOST did. He was a litle late in understanding the threat Laden posed, but eventually, he understood Al Quaeda was serious shizz. Meanwhile, George W. was in an elementary school reading when he received his news about the first tower being hit. He was clueless. The truth is we had an ethos in our country that we were untouchable. We weren’t. We still aren’t. Not an attack on Dems or a statement of Bush. Just a statement of facts. I am unaffiliated in my politics, and this does not come from media accounts. Keep in mind where I get my info, and that person has inside knowledge, no loyalty to either party, and no reason to lie. I am über-unaffiliated in my politics as well. I was just pointing out that both sides failed to stop Bin Laden. He was a slippery little snake, he was. And I, too, have friends in the know. Sometimes I wish they didn’t know so much. And of course, they can never say anything until after the fact. Makes me uncomfortable, the whole intelligence field. I was at a doctor’s office in the waiting room watching the Today Show. All the patients waiting were spellbound, holding their collective breaths as we watched the second plane hit the tower. Oddly, I went in and out of the doctor’s office, as scheduled, and no one in the office said anything. It was only when I got home that the big picture hit me. My cousin works in Washington. The office next to his was completely demolished and hs co-worker died. Fortunately, he was ok but shaken up. My daughter’s friend’s father worked in one of the towers. He was delayed on the Long Island Expressway by a fender bender. That accident saved his life. There are so many stories like that. Of people who didn’t go to work — and that saved their lives. Weird. As we move toward the Jewish Holidays, I find myself thinking about how these types of decisions are supposedly predetermined. I am reminded of those eerie passages: “Who shall die by fire and who shall die by water…” etc. I wish you a happy, healthy, New Year. September 11, 2001 – my second day back at work after 6 months off caring for my newborn daughter. There was a small black-and-white television in the staff lounge directly across from the hall from my office. I’m not sure why it was on at that time of the morning. Maybe someone had been listening to the radio at her desk, and upon hearing some news went to the tv. But within minutes of the first plane hitting, several of us were gathered around that little set and watched in horror as the second plane hit. We watched as crews around the Pentagon reported that strike as well. And our hearts sank further as we watched first one then the second tower crumble to the ground. By now everyone knew this was an act of terror. My children (the 6-month-old and almost 4-year-old) were in daycre at the Jewish Community Center. I received a phone call telling me to come pick up my children as soon as possible; the Center would be closing for the remainder of the day. After that, security became very tight, not only at airports but at the JCC, too. Only one set of doors from the outside would be unlocked so that everyone had to come in that way. There were people stationed at that door to check membership cards. Security cameras were quickly installed. Key fobs were issued to daycare parents to be able to enter through the otherwise locked doors. I tried to keep the television at home off for the next several days and weeks, lest my almost 4-year-old see and begin to build towers only to knock them down like Tech. I remember how quickly the JCC got those fobs and ID cards. Everyone was freaking out. We used to just walk in and out, no big whoop. I miss that easy-breezy, relaxed attitude when we trusted each other a bit more. With a 6-month old, you must have been thinking: “What kind of world did I bring this child into?” I know I was thinking that. And I thought it again during Columbine and after every crazy tragedy that I can’t wrap my brain around. So it was crazy for you, too? You understood the ramifications immediately? I think many Americans were dazed and confused. We realised fairly quickly, I think. But then the UK has seen quite a lot of terrorism from various quarters over the years. You would have been dazed and confused – you were right in the middle of it with no time to think let alone react. I was at the West Palm Beach Marriott Hotel helping set up for the United Way annual campaign. As I went out to the parking lot to head back to the office someone told me two commercial planes had hit the twin towers. The second plane had just hit. The man said he thought it was terrorists. I said “Ben Ladin”, because that was the only terrorist I could name. As I drove back to the United Way office I listened to the Today Show broadcast on the local radio station. I knew it was bad. They sent us home from work early, and I watched the rest unfold at home on TV. The following we we volunteered to answer phones at a telathon to raise money for the victims. I don’t think anyone will ever forget where they were that day. Larisa, I can’t even believe you knew Bin Laden’s name! I’d never heard of him before that day. Honestly, I flt like I’d been living under a rock. Like a pill bug that had just been exposed to the light, and I wanted to curl up and cry. I was so scared the US would over-react and blow someone/anyone up. Ben Laden had been in the news before in connection to other terrorist attacks. I knew who he was. I didn’t know for sure it was him until later. I’m not sure if I knew the term “Al Qaeda” back then or not. Unfortunately, although I was horrified watching everything that happened, I wasn’t shocked – at least not in the sense that I never thought it could happen here, in the US. I knew it could happen. Maybe it was from living in Israel for over a year. I still believe it can happen again, but I won’t live in fear. If we live in fear, they have already won. I know that our Country and our military are doing everything possible to protect us. That’s all we can ask. It was like Pandora’s box was opened, wasn’t it? Strange. Alien. Beyond any known person’s control.. And us– suddenly, suffocatingly more vulnerable than even a mom could imagine. Very similar to the day JFK was murdered — a shock worldwide, but here in the nation that housed his heart, his hope, his hilarity, his family — it was even worse. We had no remedy. Same with 9/11, only now.. well, now what ELSE was coming –we were all JFK, now. And when was it coming, and how and.. where? That it was visible hatred we’d seen was of no doubt, so anything at all could happen. After adult son and I got off the phone and out of the televised hell and its second coming via another hijacked plane exploding before our very eyes, I went outside into the back yard, into the sunshine and looked at the sky. I thought of those thousands of NY souls (not knowing then that there would be more, elsewhere…not even realizing there’d be over 100 countries affected by this tragedy), and I was scared, I was lost, I wasn’t home anymore– and some loved ones were too far away to gather under my shaking wings. Just then, a bird began to sing, and it flew up into the dangerous air. I thought that there were surely no birds singing in NYC today. This one here, now, was a gift like on no other day. I watched it long after it disappeared, and waited. And finally cried for them all. This is absolutely stunning! I hope you turned it into your post today! The air was dangerous that day. Even the birds felt it, I’m sure of it. I don’t remember singing birds that day, so I’m glad you had some singing in your neck of the woods. Thank you for sharing your words here today. I was doing much the same thing as you! I was talking to my mom on the phone. My three year old daughter was running around and my 6 month old son was sitting on the floor in front of the TV playing with his toys. I had on the Today show. I saw it live and my stomach dropped. I suddenly felt vulnerable and helpless. Scared and confused. I’ll never forget it. I’m rarely on my Facebook page. It was starting to take over my family life! But people have expressed a desire for me to keep it becuse they like to read my blogs there. I pop in from time to time, but since I’m not close to publishing anything right now, I have to make hard choices. And I choose to write, to walk arm and arm with friends, to table with my family and not be chained to all these electronics. I was in Houston, getting ready to fly to Richmond, VA. My flight was delayed and then cancelled. At the exact time I was on the phone on a conference call, I was the only one taking the call from home my husband came into my office and told me something had happened in New York after the second plane hit. I told those on the call after I pulled it up on the news. The call ended right then and there. I flew that Sunday. It was scary. I can hardly imagine that. Every time I get on an airplane, I run my hand against the plan to feel for loose rivets. My friend, a pilot, taught me that it one of the checks. Obviously, I can only feel about seven rivets, and what do I know about airplane safety? But to have had enough faith to fly on 9/11. Wow. I imagine you just wanted to get back home to your husband, eh? I have spent so much of the past 20 years in the air, I hardly think about it. Jet engines put me to sleep, almost immediately. Hey Renee, that was such an incredibly bizarre situation that required years of careful planning. That’s what disturbs me the most. We have to be ever-vigilant not to let something like this happen again – if it’s even possible. It was short and just captured my mood at the time I wrote it. I hope you and your family are well, my friend. Wow, I guess I can be kind of serious, too. I just read your post. You do have a serious side. I knew it. That is a beautiful photograph that you have accompanying your words! Wherever did you find it? You have to be so careful these days with copyright laws! Do you have a secret favorite place to go for pics? It may be one of my favorite photos of NYC. I don’t have a favorite spot for finding pics, Renee. I’m trying to be more careful, but when I use a photo, I look to see if it’s in print or somewhere else prominent. That particular photo was in a Dallas newspaper, but taken by a NY Times photographer. Yeah, it’s a sticky situation with photos, for sure. Yes you are right, the world is no more the same compared to it used to be 11 years earlier. Things like this repeatedly happen at our part of world too. But the sad part is that we all have lots of questions to ask, but we do not know whom to ask and how to ask. We can just pray and hope peace will again occupy its space in our lives and the planet where we live. I like the idea of peace being a tangible thing we could handle, like a book or a table or a peach. If only we could put peace in the right place and just keep it there. I remember it just like that—glued to the TV and the knowing . . .the knowing that things would be forever different in US.